Nancy Cardinal, formerly of the Oxford and Lapeer area, passed away February 6, 2019 at Meta Care in Metamora. Nancy was born May 22, 1923 to Nancy and Roy McCrandall in Flint, Michigan. She was formerly married to Emil Koteles on the 15th of April 1941 and had four sons; Anthony, who died after birth, Emil, Michael and Ronald. She later married Elmer Clifford Chenault in 1954 and had a daughter, Nancy Marie. Nancy is survived by two sons, Emil and Michael, and her daughter Nancy. She is also survived by her grandchildren Michael, Ivonne, Jason, Ranea, Ronald, Christopher, Nathan, Paul, Ben and David. She has many great-grandchildren and one beloved grandson who preceded her in death, Steven. Nancy loved to sing and dance when she was younger. Her hobbies were embroidering and crochet, and she liked to play the harmonica. 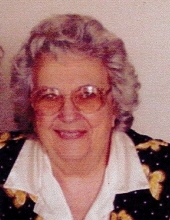 She was a believer in Jehovah God and his son Jesus Christ and attended Kingdom Halls in Lapeer, Roscommon and Oxford for many years. She knows she has faith in a resurrection to a paradise earth and has the hope to see many of her loved ones again. “Until we see you again”, when you are healthy and young again, rest in peace. Mother, Grandmother and Friend. Visitation will take place at Lynch & Sons Funeral Directors, 39 W. Burdick, Oxford on Sunday, February 10, 2019 from 2-8 PM and Monday February 11, 2019 from 10 AM-11 AM, with the funeral service beginning at 11 AM. Interment will take place at Stiles Cemetery in Lapeer. "Email Address" would like to share the life celebration of Nancy T. Cardinal. Click on the "link" to go to share a favorite memory or leave a condolence message for the family.